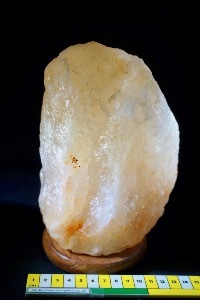 Himalayan crystal salt lamps are said to create anions (negatively charged ions) in the air. 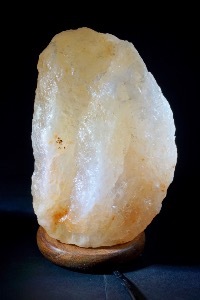 It's widely considered that electrical equipment can create potentially harmful positively charged ions (cations) in the air and cause air quality to deteriorate, using a salt lamp may help counter the cations. 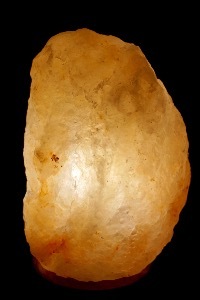 Salt Lamps can be used with an electric bulb (as this) or candle(s) depending on type, both emit a soft, golden light which can be pleasant in the home, with its relaxing glow. These lamps are made of natural crystal salt from underground mines in the Himalayas. This salt is millions of years old and as well as having the properties described above, they also have a very high mineral content. Just as being near a waterfall or at the seaside exposes us to beneficial high concentrations of anions, these lamps can be very good to help combat conditions such as allergies or asthma.